Lake Fork Trophy Bass Fishing with Pro Guide James Caldemeyer. Here are a few good tips to remember when you go on that next bass fishing trip. Many bites occur when a lure first lands. Control of your lure at this time is extremely important. Achieving control of the lure upon its entry into the water is accomplished while the lure is in flight. This is achieved by feathering the line so it is tight when the lure lands. The next immediate step is to raise the rod tip. Pay attention to the weather. The most recent weather report is vital to planning a day of bass catching. Make note of the barometric pressure, wind speed and direction, temperature and any changes coming your way. When spooling up a reel while on the water, most anglers keep the new line coming off the spool tight by running it through their hand or a wrapped towel, but be careful not to hold it too tight. The heat generated from the friction of the moving line can be enough to weaken the line. To make sure the line stays cool, you should wet your hand or the towel before you begin. Evaluating your hook-up ratio can improve your catching. When a bass goes after a swimming target he is 70% successful. When a bass goes after a crawfish he is 99.9% successful. Keep these numbers in mind when evaluating your hook up ratio. Being courteous to folks fishing. Idle when close to another angler fishing where you want to run. Give ground to an angling angler. These things will come back around your way when you are angling. In Texas spawning begins in the spring when water temperatures reach about 60°F. This could occur as early as February or as late as May, depending one where one is in the state. Males build the nests in two to eight feet of water. Largemouth bass prefer to nest in quieter, more vegetated water than other black bass, but will use any substrate besides soft mud, including submerged logs. As in Guadalupe bass, once the female has laid eggs in the nest (2,000 to 43,000) she is chased away by the male who then guards the precious eggs. The young, called fry, hatch in five to ten days. Fry remain in a group or “school” near the nest and under the male’s watch for several days after hatching. Their lifespan is on average 16 years. Two subspecies of largemouth bass exist in Texas: the native Micropterus salmoides salmoides and the Florida largemouth bass, Micropterus salmoides floridanus, which has been introduced into many Texas lakes. The largemouth bass is by far the most sought-after fish in Texas. When anglers were asked to “name the fish you prefer to catch in freshwater in Texas”, they chose largemouth bass three to one over striped bass, four to one over white bass, nearly five to one over channel catfish, and nearly ten to one over flathead catfish and white crappie. 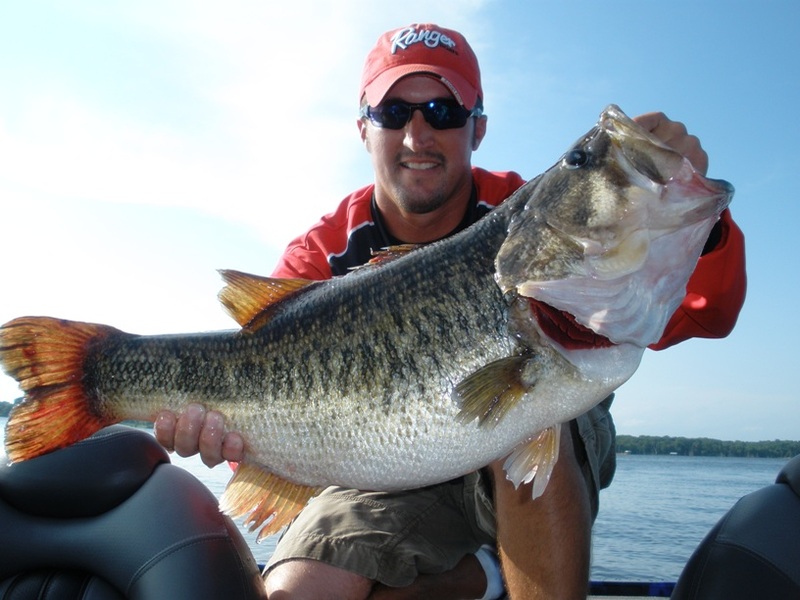 Because of the strong interest in largemouth bass fishing, there are hundreds of bass angling clubs in Texas devoted to fishing and conservation. Bass fishing adds greatly to the Texas economy each year and largemouth bass are highly prized for their value as food. Because of the species’ popularity, it has been introduced into many waters in which it did not originally occur. As with nearly all aquatic species, pollution and drought are the biggest threats to the largemouth bass population.